The Machine Stops: Did EM Forster predict the internet age? The futuristic world portrayed in The Machine Stops is an eerily familiar one - people mostly communicate with each other via screens, the rarity of face-to-face interaction has rendered it awkward, and knowledge and ideas are only shared by a system that links every home. Yet that world was imagined not by a contemporary writer but by the Edwardian author Edward Morgan Forster. 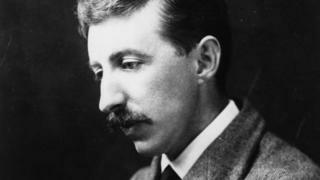 Best known for his novels about class and hypocrisy - Howards End, A Room With A View and A Passage To India - The Machine Stops was Forster's only foray into science fiction. Published in 1909, it tells the story of a mother and son - Vashti and Kuno - who live in a post-apocalyptic world where people live individually in underground pods, described as being "like the cell of a bee", and have their needs provided for by the all-encompassing Machine. It is a world where travel is rare, inhabitants communicate via video screens, and people have become so reliant on the Machine that they have begun to worship it as a living entity. Neil Duffield, who adapted the story for York Theatre Royal's stage, says it is "quite extraordinary" how much modern technology it predicts - and how sharply it observes the effects it will have on users. "He predicts the internet in the days before even radio was a mass medium. "It would have all seemed so far-fetched back in that time, when people weren't even used to telephones - and that makes it more relevant now than it was in his time - he was anticipating technology like the internet and Skype. "And he predicts, with astonishing accuracy, the effect the technology has on our relations with one another, with our bodies, with our philosophy and culture. "It's a warning for now for what we might be getting ourselves into." The play's director, Juliet Forster (no relation), brought the story to Duffield for him to turn into a play. She says she became enthralled by it in the late 1980s and "year on year, it's gained more and more relevance". "It's so eerily true and resonant. Very quickly I thought it was something that could be very interesting. Although he predicts all that technology, what's more interesting is how human beings react to it - that's what fascinates me. "Forster had such insight into human nature and the way we would adapt and lose parts of ourselves through technology. "It asks the question about how far we will go in allowing technology to be the thing that we rely on in order to function." The University of Manchester's Dr Howard Booth, a Forster expert, says that though the story is fascinating, it is those insights into human nature it offers that are more important than the predictions of technology. "People read it and say 'look, this is somebody over 100 years ago that seems to have imagined the world of the internet and the smart phone and many of the issues that we are addressing about people living their lives through technology and not looking up and seeing the world around'. "I would put that not in terms of him being some sort of great futurologist - the technology in The Machine Stops doesn't look like our technology - but in a long-standing tradition that he knew well, which questioned industrialisation and technology and the way it was starting to reach into the mind. "So he didn't see the machines of our day, but he was starting to see the issues that are involved - that what is there to supposedly aid and help us to perform certain tasks may actually become what we start to live through, need and be unable to imagine being without." Duffield agrees the story's real interest lies in what it reveals about human nature. "It's a very personal story, there's only two main characters - a mother and her son - who communicate by what we would know as Skype," he says. "That is central to the story, their very personal relationship, and the real genius of the piece is that he manages to explore the whole impact on society of that sort of technology through just two characters." And with themes discussing, as the play's director puts it, "the relationship between the material and the spiritual", it reveals how it links with the author's more familiar works. "As a genre, it's not like Forster's work, but actually, the themes are recurrent across all of his writing. "The drama between restriction and freedom. The trying to balance your physical nature and your spiritual. The need to connect across all classes and peoples. "All those things are in there that you find in his other work, but written in such a totally different world to what you might expect." Dr Booth says while the work is Forster's only overtly sci-fi story, the 12,000 word piece is "quite similar to many of his short stories, which do often have a fantasy element to them". "He did often when writing short stories take on a kind of science fiction - A Celestial Omnibus, for example, imagines going up to heaven and meeting writers there. "From Merchant Ivory [who made the film adaptations of A Room With A View and Howards End], we have a certain image of Forster, but actually the themes of The Machine Stops are Forster's themes." And the academic also has an answer for why Forster decided to write a sci-fi story. "There are a number of things that are coming to a head in 1908. One is that he's thinking more about religion - that doesn't mean orthodox Christianity, but a sense of the spiritual, of a contact with the natural world, and he thinks that things in modern life are getting in the way of that. "And those problems in modern life are also stopping people connecting with each other. "He's also reacting against a euphoric view of science and progress which, amongst the writers of the time, he associates in particular with HG Wells. And there's one very specific spur, which is an aircraft flight by a French aviator called Henri Farman, who was the first person to take a heavier-than-air aircraft - not an airship or a balloon - and do a circuit and land. "Unlike the Wright brothers, who take off and bump back to earth, this was the first time people had shown you could have air travel and navigate the aircraft. "That may seem a small thing to us, but to Forster, that suggested we were very much on the edge of a machine-like world. "He feared machines taking over, which is what The Machine Stops is all about - people losing their connection with life and the world and starting to live through machines instead." The Machine Stops is at York Theatre Royal until 4 June.